A large part of what makes the Internet amazing is that it's taken the human factor out of some things that rely on speed. The fact that e-mail has supplanted snail mail is a testament to this fact. Having to wait for a system to process and deliver your messages is just so much better in a digital environment. But what about for moments where the physical matters? Though digital photography has made leaps and strides to be accessible to all, not everyone likes to have access to photos only on their digital devices. Throw in the cost of buying a digital frame or photo printing, and complications quickly arise. So what if there was some way to combine digital photography, cheap printing and a way to send your photos to your loved ones? Postagram looks to answer that question. 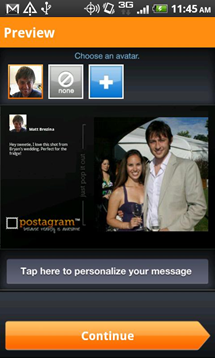 Postagram is an app that made waves earlier this year when it was released for iOS, and somehow made combining old and new media desirable; it has now crossed the platform barrier and is available for Android users. For only $0.99, you could turn any picture you wanted into a 300 dpi printed postcard, which would then be mailed to whoever you wanted. 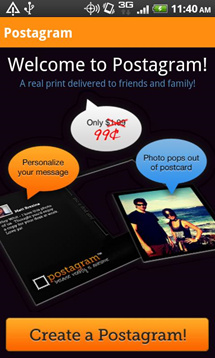 US Delivery would only take 2-5 business days, and the postcard could be personalized with a "profile picture" of the sender and a 140 character message. The photo pops out of the postcard, allowing for storage or easier collection. 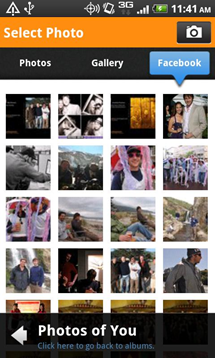 The image is chosen from your own files, through the app's camera function or by picking an image on Facebook. Postagram is a free download, but only available in the USA. 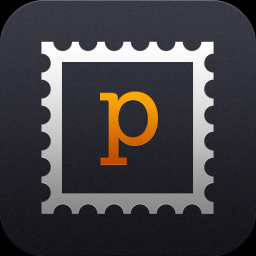 Let's hear it, readers: would you use Postagram?